Despite people trying to talk me out of it, I wants one of those iPod touch’s. Bad. What’s with people hating iPods anyway? I love iPods. Is it because it’s cool to hate what the masses are lusting after? Sure there’s cheaper players out there with more storage and features (meizu, creative, iRiver etc), but to each their own. So the question that begs to be answered is, how does a student that earns a little over $100 a week afford to buy the latest high-end consumer electronic device? I’ll be doing it the same way I did when I went from mini to video. Upgrade. It’s pretty simple. 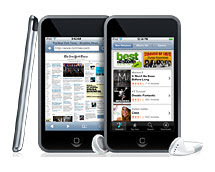 Just sell the existing iPod and pay the difference for the new one. There will be a shortfall, but there’s ways to reduce how much you have to outlay. Looking on ebay you can see that iPod video’s (30 gig) are going for about $300. Adding value to your item can be done with accessories. When I get a new toy I tend to buy all the crap that goes with it. For the iPod, that means, AV cables, docks, extra USB cables, Bluetooth headphones, carry cases etc. Most of these items aren’t that expensive, but they help you get the maximum price when you go to sell it. People are going to be more likely to pay a little extra for an item that’s bundled with all the accessories they’ll need. So accessorise to get the most at selling time. I have over 100 movies and a few hundred tv shows all in iPod format that, when burned to dvd can be included as a value add option. And don’t forget the value you have in all your music. I have 17,000 songs in iTunes, so there’s bound to be something in there that someone will want. After you sell it, the shortfall shouldn’t be too much ($100 - $200 or so). Then it’s just a matter of getting to the apple store and laying down the cash for a new 16 gig iPod touch. would it not be wiser to buy a machine that can at least actually handle this unit ? or is more a show n tell thing ? an live in sync misery daily thing? my machine can handle it ok. and yeah it's all about the show. i make no excuse for that. i'm a shameless consumer / whore.